If you’re like me, your TBR list is multiple pages long, your bookshelves are bursting at the seams, you have holds on several different things on hold through inter-library loan, and yet you still have the same argument with yourself every time you pass a bookstore, or the library, or need to buy something on Amazon: do you really need more books? YES. THE ANSWER IS ALWAYS YES. So here are some books to add to your Amazon cart or GoodReads list that I’m particularly looking forward to this year. Nadia’s 12th birthday marks the beginning of the Arab Spring with a horrific protest in Tunisia, and three years later, her family has decided they need to leave their home in Syria, which is now in the middle of a civil war, for a safer location. But amidst the bombing, she gets separated from her family and has to rely on her on ingenuity to get her to the safety of the Turkish border and find her family again. Students (and adults) need more stories like these to help make sense of all the very real horror happening in that part of the world. I love a good standalone graphic novel, and this one sounds right up my alley. When the main character is described as having “uncool hair and unfortunate acne” and works parttime at the local library, I’m immediately like, I feel you. While working at said library, Willow Sparks uncovers a book with her name on it, and she discovers that writing in the book changes her future (like actually, not in a metaphoric sense). Exciting at first, until Willow realizes her rewrites can have dire consequences. Based on the true story of Ali Fadhil, who was 11 in 1991 when the U.S. invaded Iraq in Operation Desert Storm. While most of our students have memory (or at least a frame of reference) for the ongoing “War on Terror” in Iraq, this earlier conflict is largely unknown to them. Heck, it’s largely unknown to me. I was three at the time. In this story readers will get a glimpse into the simultaneous mundane aspects and devastation of war through the eyes of a boy who lived it. While Prince Sebastian’s parents are busy finding him a future bride, Sebastian and his best friend, dressmaker Frances, know the truth: at night, Sebastian likes to put on dresses and take to the streets of Paris as Lady Crystallia. The SLJ review suggests this is a good step up for fans of Raina Telgemeier’s and Victoria Jamieson’s, and I have plenty of fans of both those ladies. Super excited for this one. I’ve been perhaps disproportionately interested in Indian literature since taking an Indian Lit class my sophomore year of college, but I just can’t get enough of them. I have nearly an entire shelf of adult Indian lit at home, but rarely is there middle grade or YA published that is set in this country. I was thrilled to see this one come up. Written as letters to her mother (who died when she was a baby), this middle grade novel tells the story of 12 year old Nisha during the tumultuous year of 1947, when India was divided into two countries based on religion. Nisha has to come to terms with what it means to be “home”, as her family embarks on a journey to what they hope will be a peaceful future. I follow Colby on Twitter, so when he first started talking about this one, I was immediately intrigued. The basic premise is that Colby invited more than 40 authors/illustrators/creators to write story prompts, those prompts were swapped, and magical creativity ensued! This is the collection of all the projects developed from those prompts, including work from some of our favorite people: Sherman Alexie, Kate DiCamillo, Peter Brown, R.J. Palacio, Laurel Snyder, gah, I could go on and on, because there are SO MANY great contributors to this!!! 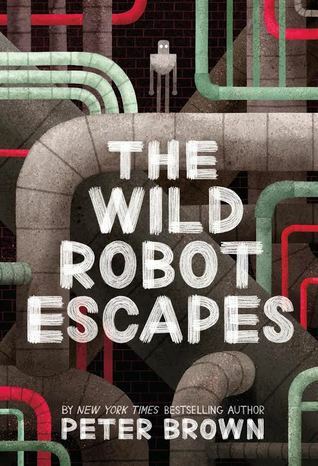 I looovvvved the The Wild Robot when I read it this summer, and am so excited for the second addition to Roz’s story. I anticipate more sweet drawings and more charming interactions from the characters in the sequel. This one picks up where the other left off, so if you haven’t read the first one, check that one out first! We’ve gotten All American Boys, The Hate U Give, Dear Martin, and others from the YA community in response to the increase of police shootings of brown skinned people, and now Rhodes gives that response for the younger set in this middle grade novel about 12 year old Jerome, who is shot and killed when a police officer mistakes his toy gun for a real gun. Jerome’s ghost meets the ghost of Emmitt Till, another young victim of racial violence, who helps him process the fallout of what happened to him. 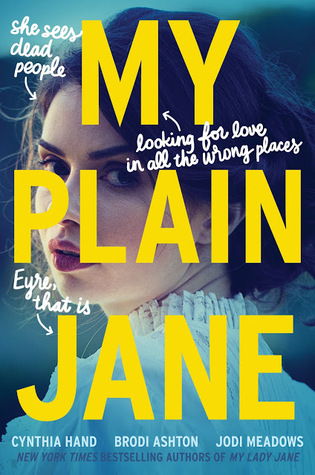 I thoroughly enjoyed last year’s My Lady Jane, so was excited to see another installment in the “the Lady Janies.” This one is a fantastical reimagining of a fictional character rather than a historical one, focusing on Bronte’s titular character, Jane Eyre. Having read the original not too long ago during grad school, I can’t wait to dig into this one where Jane is not only a governess, but also a ghost hunter. Yes, please. My new principal is big on community outreach, and also big on social media. Thus, in an effort to follow his example, I tried something new this year, putting together a Holiday Gift Guide for parents/grandparents/mentors of some of my favorite middle school books that I read during 2017. Plus, now I can share it with all of you! I have to say, it was tough narrowing it down to what would reasonably fit on one front/back page, and with the 14 I selected, I edged on the side of those that would be popular with my kiddos, and not necessarily my top 14 from the year (although my top three are definitely on here). Without further ado or explanation, here it is. Please feel free to use and share as you’re doing all your shopping this season! Download Mrs. Pataky’s 2017 Holiday Gift Guide here. Guess what, guys? I found another one to hand to those students who have Raina Telgemeier’s books on constant rotation! A couple years ago I added El Deafo, last year I added Roller Girl, and now we have Real Friends! This graphic memoir tells the story of Shannon Hale’s elementary years and her difficulty establishing valuable friendships. From the popular girl who is the leader of “The Group” to the girl she meets when crying in the bushes, young Shannon navigates the tricky waters of figuring out what makes a good friend and how to be a good friend. Through a lot of bumps and emotional bruises, Shannon learns that real friends help you to become the best version of yourself. Super relateable and helpful for those younger middle graders battling the same struggles. I realize I’m a little late to the reviewing game on this one, seeing that big shiny gold medal in the corner of the cover, but I can’t help but talk about it. And there may still be a few readers out there like me who haven’t picked it up yet! That shiny gold medal can be a divisive one for readers… some will automatically gravitate toward award winners, because they know they have been thoroughly vetted by a group of knowledgeable people. Others, though, will particularly avoid Newbery medalists (in particular), because they have had a bit of a reputation in the past for not choosing readable books for kids. They might be literary gems, but aren’t engaging for the relevant audience of (typically) middle grade readers. That seems to have changed in the past several years though, with the likes of The Crossover, Last Stop on Market Street, and of course, One and Only Ivan (which I can literally give to any student and know it will be a positive experience). I’m not sure where this year’s winner will fall in that spectrum, but I’m sure going to try to make it be one of those that kids will devour too. This one reads like a delicious fairy tale, one that has dark and twisty edges like “Hansel and Gretel” or “Rumpelstiltskin”, rather than “The Emperor’s New Clothes”, for instance. In the village known as the Protectorate, villagers know that every year on the Day of Sacrifice, the youngest baby in the Protectorate will be taken out into the woods to be left for the witch. Because of this annual tragedy, a cloud of sorrow hangs over the village, although the parents of the sacrificed baby have always willingly complied. Until this year, that is. This year, the youngest baby’s mother is driven mad with grief, and is locked in a tower in the center of the Protectorate to live out her days. Her baby is taken to the clearing in the woods and left for dead. Here’s the really grim part: the leaders of the Protectorate know the witch story is just made up. They know the baby is likely just eaten by wild animals or dies of starvation or thirst. The Day of Sacrifice is a tool of manipulation, one meant to keep the people in line. Yikes. HOWEVER! There IS a witch in the woods! And she DOES come to get the babies each year! Of course, this witch is a good witch who has no idea why these infants are being left in the woods. She’s practical though, and when she sees a problem (particularly one like an innocent babe being left to fend for itself in the woods), she’s apt to solve it. So every year, she embarks on a journey through the deep and dangerous forest to retrieve the child and take it across the world to the Free Cities where she finds a loving adoptive family to raise it. On the journey, she typically feeds the baby starlight, giving them a little magical glow that stays with them for the rest of their lives. But this year, this baby, she accidentally feeds her with moonlight. And it turns out moonlight gives you more than a magical glow. It gives you MAGIC. Babies aren’t supposed to be enmagicked because they can’t control it, so the witch decides to adopt the baby herself to look after her. Add in a sweet swamp monster and a tiny dragon who thinks he’s huge, and we’ve got the beginnings of a fantastic fairytale. The layers to this tale are complex and suspenseful, and the narrator’s language made me want to read this aloud. (I did. I did read it aloud. To my dog.) I think this would be a great classroom novel that could also be used in short chunks to discuss mood, tone, or word choice. I don’t think that every middle grade reader is going to love this one if tackling it on their own (like Crossover or Ivan), but maybe that’s another reason why it’s special. It has a special reader in mind. A writing style analysis of a steampunk series opener: Monsters, robots, and POV, oh my! In anticipation of Alan Gratz’s author visit to our school in October, I’ve been attempting to read through all the books of his we own in our library. His black/white/red covered books (see: Prisoner B-3087, Projekt 1065, and Code of Honor) are wildly popular with our students, and while I can definitely understand why that is the case, they weren’t doing the same for me. I liked them fine, but I didn’t love them. It was starting to make me feel anxious. As a librarian, I want to be able to earnestly and honestly and exuberantly push these books on my students prior to his visit. I was trying to piece together what the issue was until I opened up League of Seven, and was immediately gripped by the story. Phew. Our main character is 12-year-old Archie Dent, son to researchers for the Septemberists, a secret society aimed at keeping the world safe from the Mangleborn, massive world-destroying monsters. Several times throughout the history of humankind, the Mangleborn have risen up and destroyed civilizations, and it is only through a League of Seven heroes that they are quelled and trapped beneath the earth once again. It’s been many generations since the Mangleborn have awoken, but according to research by Archie’s parents, there are rumblings of a rebirth. This becomes very clear when they arrive at the Septemberist headquarters and council has been infiltrated and taken over by strange bug-like creatures buried in the backs of the council-members necks. Soon Archie learns that Thomas Alva Edison, evil genius, is attempting to use lektricity to awaken the Swarm Queen, a Mangleborn locked under the swamps of Florida, and he is using Archie’s parents to help him. Archie is thrown together with two other young people, Fergus — whose impressive mechanical knowledge makes him desirable to Edison — and Hachi — a First Nations girl who has great skills in weaponry and a vengeful death wish for Edison — and together, they must figure out a way to stop Edison and the Swarm Queen from killing Archie’s parents and destroying the world. No biggie. Okay, so there are some definite differences between League of Seven, and the black/white/red books (subsequently referred to as BWR books). First of all: genre. League of Seven is an alternative steampunk historical fiction novel (as opposed to realistic historical fiction). We’ve got some some robots, some ancient legends, some real-life characters making a very different impact on society (hello there, villainous Thomas Edison), all set in a much different picture of 1870s America. Secondly, tense. I’ve noticed his other books (that I’ve read so far) are written in present tense. This gives the narrative an urgent, action-driven focus. For some reason, this tense style feels more juvenile for me. Again, I see value in it for the intended audience, but for me, it’s not my preference. League is written in past tense. Next, point of view. League is written primarily in the third-person limited perspective (with Archie being the limited scope), although we do see a more omniscient perspective occasionally. This is my FAVORITE pov to read. I think it gives the author flexibility while still allowing the reader to feel personally connected to the protagonist. I think it also lends authenticity to the text. The BWR books are written in first person, which again, tends to be the more comfortable choice for my students. However, authors who write for middle grade audiences are still ADULTS (primarily), and when they write in a tween voice, even the best authors are impostors. Now maybe my English major analyzer is in overdrive here and these aspects are just correlation not causation. I feel like I’ll certainly be more aware of these things in the future. Let’s just say I’m super pumped to be able to promote this series to my students this fall in anticipation of Alan’s visit. I’ll still booktalk all his books, but the BWRs basically promote themselves. League is a little more off the beaten path, but I think will be a HUGE hit with those insatiable fans of our dear friend Rick Riordan. 2.5 stars. Next two books in the series are already out!